We’ve been waiting for this day so badly, that I can’t find the proper words. Now, I know I sound like some mental geek or whatever term you would prefer to use, but this is a mixed bag. Yes – the software itself is amazing, and every component is truly leveraging the platform of Windows Server 2012. My bread and butter, which is Hyper-V, is most likely the most interesting I’ve been working with in my career, and Virtual Machine Manager will give this world class hypervisor some steroids in the long run. A much, much deeper cluster and fabric integration than in previously releases, and all in all, better fabric management. Enhancements in services as well, letting you create more sophisticated distributed applications, using both Windows Servers and Linux – and you don’t have the domain limitations either. Network virtualization and SMB3.0 support is one of the major topics. VMM will take care of it all. Enables Windows Server 2012 and System Center 2012 to work together and also simplifies configuration and administration of new features introduced in Windows Server 2012 such as Hyper-V virtual networking. Enables you to monitor applications from outside your organization using the Global Service Monitor service, giving you a user’s view of application availability. Using the Operations Manager component of System Center 2012 you can schedule and monitor the results of synthetic transactions run against your web-facing application from the many Azure points of presence across the globe. Enables you to move virtual machines between your on-premises servers and Windows Azure with manual and automated management operations, further integrating Windows Azure cloud capacity into your datacenter. System Center 2012 SP1 is only available on TechNet/MSDN for evaluation, testing and development (NO PRODUCTION), so use your TechNet/MSDN subscription to access the bits. .... or Hyper-V doesn’t report performance to VMM. One of my customers where having some issues in their development environment today, using Hyper-V in Windows Server 2012 and System Center 2012 SP1 Virtual Machine Manager (BETA). The issue was that in the VMM console, the performance view was static, and didn’t show any changes at all. Since I have some experience with SQL servers over the years, I was guessing there was something wrong with the performance counters on the hosts itself, since everything else was working as expected (all management operations initiated from the VMM console). The last thing we did, just to have everything straight, was to reinstall the VMM agent on the hosts. Remove - and add the hosts to a host group in VMM. Once this had completed, VMM reported hosts performance as expected. So what’s the Microsoft Service Template Explorer Beta program? This new cool concepts let you deploy scalable, multi-tier applications in your private cloud. The Service Template Explorer Beta program is an add-in to your VMM server, so that you can explore, download and import service templates directly to your VMM infrastructure, and leverage pre-configured templates from Corp. If you have been exploring the massive service concept, you have probably seen that it may be complex to deploy all the wide diversity of server roles, applications, and to select the proper deployment order and so on. The service templates from Corp is already configured so that you can deploy them into your environment, ready to be used. Since Hyper-V and System Center now supports network virtualization, you would probably think this is great. Customers, application owners etc, can now deploy their own domain controllers through service deployment in an isolated network. Maybe they have an application that requires domain access, or just simply wants to deploy an infrastructure in a quickly and reliable manner. Oh, and remember. If you touch some of the advanced OS configuration in a VM template, like server roles and features, the template will be deployed as a Service instead of a virtual machine – or else these options would be ignored during deployment. A service template ready to serve the need for a DNS infrastructure with all the required roles and features enabled for install. This service template will include the DHCP role, but if your VMM server will manage the IP addresses and configuration in your virtual environment – also for your VM networks, you might leave this one alone. Personally, I find this template quite useful in my demo and lab environment, where I can quickly show off the SMB3.0 enhancements to simulate continuously availability and virtual machines over a network share. A lot of other scenarios will require file services too, so this is a good template. A lot has been done with IIS in Windows Server 2012, and this template will let you benefit from it all. If you are deploying traditional service templates – which has native support for Server App-V, web applications and dacpacs, this one is very handy. 1. Install the .msi file to a preferred destination. 4. Once the import has completed successfully, go to ‘VMs and Services’ workspace in VMM. 6. You’ll be presented to the available templates from Corp and you can download these bits to your library. Once this is completed, you can import the templates into your VMM library server(s) and map them to your resources (networks, VHDs). The screenshot below is an example of a service deployment in my environment, using the Active Directory service template. As you can see, the service is installed with AD DS and is ready to be promoted as a Domain Controller. This blog post is about how you can integrate and take advantage of SMB3.0 in Windows Server 2012 with System Center 2012 SP1 Virtual Machine Manager. Now, let’s take a look on how you can add your SMB3.0 shares from your file server and scale-out file server to the storage space in fabric. Virtual Machine Manager provides you with a single-pane-of-glass view into your datacenter infrastructure. All the physical components remain in the Fabric workspace. Here you can manage your virtualization hosts and the other server roles to support their life cycle, and you can manage your datacenter network and create a network models which helps you to administer and manage access, connectivity and capability for your hosts, clusters, VMs and services. And last but not least, if you have a storage solution that either support SMB3.0, SMI-S or SMP, you can add that too. In other words, fabric is equal to infrastructure: Compute, networking and storage. Other terms to describe this is ‘stamps’ and ‘scale units’. 4. Right click on your newly created share, select properties, and mark the ‘Managed by VMM’ checkbox. So what does this gives? If you have been working with SMB3.0 for server applications in Windows Server 2012 (read Hyper-V) then you are probably familiar with the required steps for this to work as far as the permissions concerns. VMM does this for you, so you don’t have to stress with it. When you add a Hyper-V host, VMM will use those credentials (RunAs accounts) when assigning permissions to the shares created on your file servers. This is a management domain account (yes, SMB3.0 in this context will require an Active Directory domain to work anyhow). 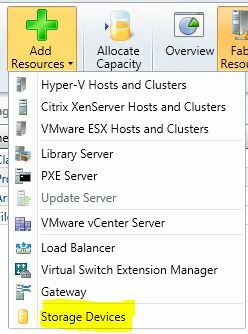 So when you are adding a new host to a cluster, for example, VMM will update the permissions on all shares registered to the cluster during the refresh process. Good luck with your SMB3.0 adoption in your fabric, and feel free to comment on this post if you have any questions, issues or just want to connect. While working with the Beta bits of VMM the other day, I encountered a great enhancement in the Fabric space. · Add the WSUS server to VMM. Now, in System Center 2012 SP1, you only have to do the following when dealing with Windows Server 2012 OS’s. All in all, the WSUS integration is a critical component to support the life-cycle of your servers in the private cloud fabric, and it's great to see a more streamlined deployment and configuration experience in SP1.